Fritz Keck-Oil Portraits of Historic Pittsburgh - Go Foxburg! 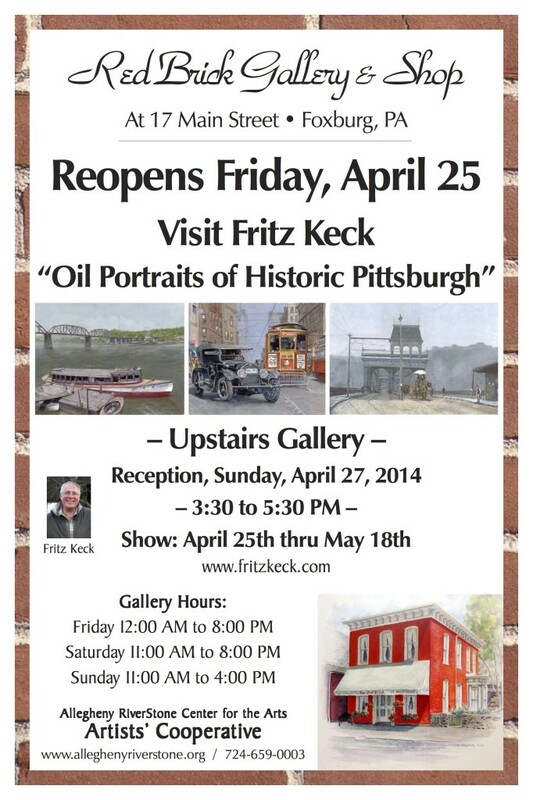 The Red Brick Gallery and Shop in Foxburg, Allegheny RiverStone Center for the Arts (ARCA) artist cooperative reopened its 2014 season on Friday April 25th with an exhibit of“Oil Portraits of Historic Pittsburgh”, displaying the captivating work of Fritz Keck. An Opening reception was held on Sunday, April 27th, from 3:30 to 5:30 PM providing an opportunity to meet and visit with Fritz Keck. The reception coincided with ARCA’s marvelous afternoon concert at Lincoln Hall presenting the up and coming piano virtuoso Alvin Zhu. The Red Brick is located at 17 Main Street in “downtown” Foxburg and is open on week ends, with new extended hours beginning Friday April 25th till the end of the year: Friday Noon to 8 PM, Saturday 11 AM to 8 PM and Sunday 11 AM to 4 PM.